Last week a group of NEHGS staff members joined 22,000 attendees at the 2015 RootsTech Conference in Salt Lake City, Utah, for four days of learning, research, and fun. At the keynote session of the conference, NEHGS and FamilySearch made a historic announcement: a multi-year collaboration between the two nonprofit organizations to share data, digitize new records, and work to build an online family tree experience for NEHGS constituents. Under a multi-year agreement, we will add more than 1 billion name records from the FamilySearch global historic record collections to AmericanAncestors.org and another 1 billion records from the FamilySearch family tree to our future family tree experience. 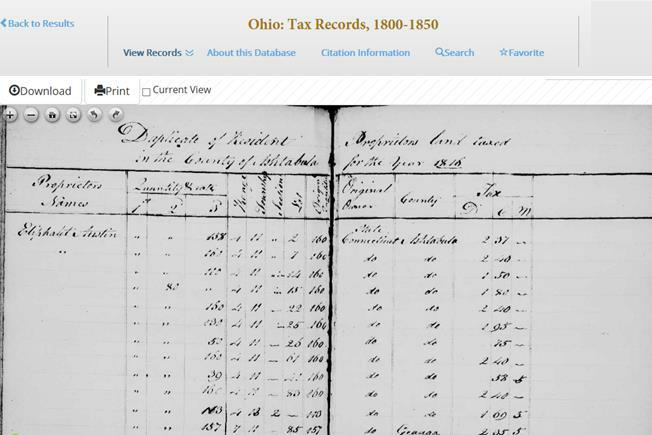 The searchable and browsable records to be added to the NEHGS website include U.S. federal census transcripts (1790–1930); civil registrations for Italy, Germany, Scotland, and the Netherlands; English birth, christening, marriage, and death record transcripts dating from the fifteenth century through the twentieth century; and a panoply of census records, birth records, marriage records, and death records for states across the U.S. In turn, members of The Church of Jesus Christ of Latter-day Saints will have access to portions of AmericanAncestors.org through online affiliate accounts. In addition, NEHGS and FamilySearch will work together to digitize and make accessible unique materials from the NEHGS collection such as cemetery records from around the U.S. and Canada, historic tax records, early American military records, early New England marriage records, historic newspapers, and original scholarship from NEHGS published books. Founded in 1845, New England Historic Genealogical Society is America’s oldest and most respected resource for family history research and the largest genealogical society in America today. Although the institution’s name says “New England,” our organization is national in scope and provides expertise and research materials through AmericanAncestors.org in nearly all aspects of family history, from seventeenth-century colonial New England, New York, Pennsylvania, and Virginia through twenty-first-century immigration research. For FamilySearch this collaboration will provide indispensable assistance to Latter-day Saint family historians by consolidating resources and providing a breadth of information unavailable elsewhere. By partnering with us, FamilySearch is making an unprecedented scope of data available and accessible to the members of the LDS Church, some very eager consumers of historical materials. The ease of access to New England records will prove very encouraging to novice genealogists, and downright exciting to more seasoned enthusiasts. FamilySearch and New England Historic Genealogical Society keenly understand the importance of collaboration in family history. Our two organizations are teaming together to help provide high-quality solutions and experiences for the family history community. * This project was indexed in partnership between FamilySearch and the Ohio Genealogical Society. 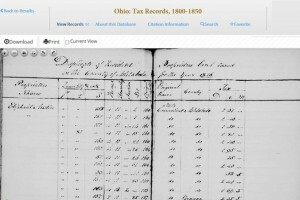 Name index of tax records as recorded with the County Auditor of each county. Includes the following Ohio counties: Ashtabula, Belmont, Carroll, Columbiana, Guernsey, Harrison, Jackson, Jefferson, Monroe, Trumbull and Washington. The majority of the tax records in this collection are for the years 1816 through 1838. Unless I misunderstood, the downside of this joint venture is: it takes records from a site that is normally free and transfers them to a site that has a membership fee. Existing records on FamilySearch will remain on FamilySearch. Under this agreement those records will also be available on the NEHGS website. The goal is to provide as many resources to researchers as possible on whichever website they use most. BUT this means the Society’s “informational holdings”, which it holds proprietarily & as noted above “behind a PAYWALL”, will now be FREE at FamilySearch. The press release mentions no restrictions on types of items uploaded. Clearly, one such under-utilized by Society members yet uniquely and absolutely PROPRIETARY holding is Special Collections; The Chamberlain Collection, for instance, looks to be Imaged page by page and thus made FREE at FamilySearch. I warned Ralph about this in 1999-2000. Marketing growth is partially dependent on making a lot of things available only behind a paywall and by putting more quality & unique items behind it PLUS adding value what ever ways you can to the collection. You also develop marketing by bringing other societies and their under-utilized collections under the American Ancestors umbrella collaboratively — first NE societies and groups, then New York State, etc. Empire growth, yes, but not at the expense of the core uniqueness. Now I can certainly see the attractiveness of having low-cost access to up-to-date technical skills from FamilySearch that would enable the Society/AA to more quickly image ALL of Special Collections. Budget saver, sure. But the TRADE-OFF is all of that becomes FREE. So, strategically, I don’t see how this turns into membership gains (i.e. the 100,000 member level I also pitched to Ralph and Brent). And dues paying & bequeathing members are the pay-it-forward life blood of any nonprofit. Looks like you’ve sold the Birthright for a Bowel without the Porridge. Thin gruel, indeed. Enlighten me how this isn’t so. I’ve bookmarked Ancestry’s GHMNH images because, while their search engine can’t find Surname Headings, such as “BUTLER”, it CAN find every other appearance of that name or names & places in the book, i.e. Butler, Thomas Butler, Kittery, etc. A VIRTUAL INDEX as it were. A super resource as references to people don’t completely appear in individual sketches. Never knew that, didja? To be clear, this agreement does not include a transference of any databases or database records from AmericanAncestors.org to FamilySearch. You correctly note that we will benefit from the technical skills FamilySearch has to digitize new materials from our collection. It is important note that most of those collections to be digitized under this agreement are ones for which we have an obligation to make available publicly or is already in the public domain, but heretofore, we did not have the resources to digitize. With regard to expanding our content, this is indeed true, and is a natural outgrowth of the expanding research of our members. For example, we have long had a New York collection in print and in manuscripts. After Massachusetts, New York is the top area that members ask us to add more content for. So, over the last several years, that has been one particular area of focus in our database building efforts. We have also maintained a tight focus on New England, heeding your counsel, by bringing under-utilized collections from other societies, such as many fine journals like The Mayflower Descendant, The Maine Genealogist, Rhode Island Roots, etc. online. Since I already have an account with NEHGS; what would I lose by dropping that and just using what-ever would be available with the FamilySearch partnership??? $$$?? The benefits of NEHGS membership over just the partnership are that you now have access to many unique records and helpful services which are member-only benefits: databases such as The Great Migration series and Massachusetts Vital Records, publications such as The Register and American Ancestors magazine, access to staff experts through our Ask-a-Genealogist Service, discounts on books an research-for-hire, and, of course, use of the library either in person or from home through the digital library. As I understand this, the only persons able to access the information on Family Search from NEHGS will be members of the LDS Church and those who are not LDS members will not be able to access this information. Am I correct in my understanding? There are no LDS-only restrictions on NEHGS materials. The records NEHGS will be providing to FamilySearch are new materials from our collection that are yet to be digitized. When those projects are completed those records will be on both AmericanAncestors.org and FamilySearch.org. The FamilySearch records currently being added to AmericanAncestors.org are and will be available to NEHGS members as well as members of the LDS church. Many of those records being added are currently on FamilySearch.org and available to any user of that site. Frankly, it’s not about the money. Yes, none of us are rich. Some of us still use stamps and envelopes to write to Mid-Continent Public or Allen County libraries for copies of histories that can’t otherwise be found. Obviously, no ordinary soul doing genealogy has money to throw away. What we do have is the desire to take advantage when ever possible of any sources (or opportunities) as might be made most meet and available. I find this agreement between Salt Lake and NEHGS to be much like the Mayflower Compact of like minded interests. I have to applaud Mr. Simons on this one. He is certainly making sure that his legacy at NEHGS will be one that tried to take care of all of our research needs – and answers – wherever we might find them. Thank you for your comment. Indeed, this collaboration is meant to increase record access for family historians writ large. We hope that our constituents will benefit from the addition of many new records to AmericanAncestors.org that are coming from the FamilySearch collection. These records will include collections for New England (expanded MA VRs for example) and places of immigration (NY and Ohio) and emigration (English parish registers) related to New England, as well as other many other records for the broad audience of family historians that make up our membership. Likewise, FamilySearch’s constituency (and NEHGS’s) will gain access to many new records that were previously only available in hardcopy in our library. When someone says “It isn’t about the $”, its ALWAYS about the $. Looks like the gamble here is that Sharing Proprietary Material is considered a method by which the BRAND can be extended to people who are not aware of it, thereby attracting more people into Society membership. And the more people join (perhaps hitting my pitched 100K level; we are at over 50K now), the more people may take advantage of the Society’s proactive services, ESPECIALLY the Research Services (which at $50+/hr means I make NO use of it at all even though the Society has material I would like to consult and did consult when I was a Sat. regular). It has to be the above as, there doesn’t seem to be a stated agreement sub-section covering reimbursement of overhead costs between the 2 entities, and you and I both know that some such section has to exist. Such an agreement would be “break-even” in theory. So membership gain has to be the $ motivator, the concern being “Have we plateaued?” As part of the Capital Campaign, the consulting/managing firm would have addressed that question in a report to the Council not made public to us members. A required self-audit of where we are-where do we go. SOP in the field. Some sort of agreement with Family Search is/was inevitable. Its the 8000 lb gorilla in the genealogy field with vast $ resources behind it. Families like the Marriots are just the pointy-tip of the iceberg, which is made up of those millions of small family contributions, motivated in particular ways that no generic non-profit can match. So some arrangement on sharing resources was inevitable. I’m presently objecting to such a deal as this at this time in the Society/AA’s development. We are still an 80 lb gorilla. I thought the POINT of the Re-organization into the Council structure, the Capital Campaign and the AA re-branding was to turn us into an 800 lb gorilla heading towards 400 lb Silverback status. I’m on board with that. I think the down-line consequences of this deal at this time for the Society/AA are strategically weak, if not negative. Let’s see how Ryan responds. Thanks for your comments! For me, all this back-and-forth wringing of hands and bit of contention is due to slightly skewed perspectives on the subject of genealogy. Those who bash FamilySearch may be expecting to find family trees of NEHGS quality, whereas most of what they find has been compiled by less-well-trained individuals. The real treasures to be found on FS are the billions of digitized public and ecclesiastical worldwide records–>Primary Sources!–to which you will have access. And those databases are constantly multiplying. I enthusiastically welcome this latest development in family history resources. I am dumfounded by NEHGS’ intention to incorporate the extremely error-filled FamilySearch Family Tree (compiled in the main from computer-program-woggled versions of user-submitted trees). What a waste of server-power. NEHGS members already can go look at that mess free, if they wish–they have only to register at that site. I object to NEHGS’ adding any cachet to it. I object to any implication that any element of that tree is implicitly accurate. It is, in part, because of the historically unreliable nature of online family trees that we, NEHGS, would like to make a contribution to that growing element of the field. Recent analysis of the most used genealogy websites shows that at least 20% of daily traffic is to online family trees– and that is without including anyone who uses trees within the Ancestry.com environment or the FamilySearch environment. In short, a lot of family historians are accessing information that may not be accurate, and at least is very likely unsourced—we’d like to help change that. Because of the nature of our constituency, a community that has a very high concentration of genealogical scholars and skilled researchers who have documented and published their work so that is both trustworthy and verifiable, we are looking to build a family tree experience that allows more people to benefit from the values that inform our publications and databases. In addition to trying to create a higher quality family tree experience to counterbalance the historically unreliable nature of them, we are also interested in offering family trees because while we do have perhaps the highest concentration of genealogical scholars and skilled researchers in the field, a vast majority of members do not publish, therefore, their trustworthy and documented work never has an opportunity to benefit others. Trees, we hope, will provide another means for people to share their high-quality work. With regard to the 1 billion records from FamilySearch, we will have access to those records in a future state, but we do not intend to import them wholesale nor do we plan to introduce all of those records into the NEHGS search environment, rather, if someone uses an NEHGS tree, and would like the opportunity to seek out other information on other trees on other sites, that mechanism will be available. Ryan, thank you for presenting the rationale regarding the FamilySearch Tree. Well, that is kind of the point. The FamilySearch tree is a wiki. Anything can be changed by anyone for any or no reason. Anything can be changed by the FS computer program that is presently attempting to migrate the material in its preliminary attempt at a One World Tree (the site called new.FamilySearch) to the revised Family Tree. I frequently find errors in such recent changes. This will not be stopped until perhaps 2016. At present the LDS policy is not to permit entering same-gender marriages. The program does not allow it. At present there is a coded problem with allocating sources to events, such as to Marriage Bonds, Marriage Banns, Marriage Intentions Published, Marriage Intentions Registered, Betrothals, Marriage Licenses Issued . . . . all conflated under “Married” as indexed on the FamilySearch site, and difficult in any event to add to that category where sources are found. The FS-Tree does not allow linking indexed persons in roles such as baptismal sponsor or guardian. These are just a very few of the issues with the program (also known as GEDCOM X) which FS wants to make be an industry standard. Experienced and careful researchers will find working with this behemoth frustrating and at times offensive. Use of home genealogy programs at least allow accuracy on the above points, even if they not facilitate broader presentation of family contexts and kin-group migrations. One reason I’m here is the Active Professional Standards embodied in the material presented and curated by the Society. Quality Control is non-existent in all those family trees at Ancestry and FamilySearch. Zip, nada, none. Its ALL just “oral history” subject to re-footnoting. Let us grow bigger, and BETTER. It is NOT “ALL just “oral history” subject to re-footnoting”–certain of the databases, e.g. the old Ancestral File, are as you describe, but the billions of microfilmed records are world-wide civil and church documents with full annotations! Likewise, while many of the Personal family trees MAY be “just oral history” or, more likely, just copied from other contributors, many are just as carefully compiled as yours. It is for the individual researcher to decide if and how to rely on those secondary sources, or potentially to contact the contributors. But do not reject the billions of microfilmed Primary sources that FamilySearch is giving you! I am replying on a break from taking notes on Baggs family deeds from Hampshire Co., MA Land Records as imaged and online at FamilySearch. I am doing so, sitting in my office space, using my laptop, while the sun rises just south of Portland, Oregon. This is a VAST IMPROVEMENT over traveling from Acton to Springfield and staying over night so as to do an every-name-I-can-possibly-think-of search all the next day at the county court. And more efficient than coming in to the Society on repeated Saturdays to crank & crank microfilm for these images (and that only after the Society got its own rolls, decades into my membership–but I DO miss you people on the 4th floor as there’s a lot to be said for camaraderie). Having those kinds of sources available AT ANY TIME OF THE DAY means I can do a much more adequate job on sketching the people in my various projects, and that, why, I might actually FINISH one of these projects! Just got to plug away and away and away, heave ho! Putting up the images it has on microfilm, while continuing to add more records to its microfilm holdings, is an endeavor for which FamilySearch deserves ALL the praise. (The Mass. Hist. Society is also doing the same thing.) And even as badly as Ancestry does it with such “databases” as high school year books or organizational annuals, at least stuff is there, and so yes they deserve a pat on the back, too. But in their family tree formats, really, cut and paste is what its all about. Their tree formats do NOT encourage “evidencing” (i.e. footnoting). Ancestry makes a stab with its sources format, but of course its all up to you the general user to relearn what evidence and footnoting really mean. I’ve followed sourcing from one tree to another tree to another tree to another tree to, well, maybe something I can recognize as a real source. A few times, in the end I’ve found that I’ve been the source! Weird feeling. The audience that Ancestry and FamilySearch generally target are hobbyists, not academia from which I derive my interests and scholarly training. That’s OK. Stuff gets up about people I would never have had a hope of even knowing existed, but then it needs to be verified, or my use of it turns into a Running Round Robin’s Barn time-waster. And wasting the time of some future researcher undermines my own professed standards. Jade has expressed my feelings precisely! I too am dumbfounded. NEHGS has always represented research excellence and true scholarship. With rare exception, if the source of data was NEHGS, it could be trusted and would stand up to scholarly scrutiny. Although I have often used Mormon temple and stake libraries since the 1970s (including Salt Lake City) and Mormon owned databases and resources, it is always with the mandate to carefully verify every minute detail. Family lines that I have carefully researched using primary sources have become thoroughly polluted online. I am grateful to both institutions for furthering my knowledge of my family. But Ancestry.com (and its ilk) is, to me, the proof that Gresham’s Law about currencies applies to genealogical research: that bad research drives out the good. Thanks, Robert Gerrity, for adding your advice and experience. This did not appear where I intended it, as a reply to Jade, above. Can it be deleted or moved to that location? Thanks. Poor Ryan – give the man a break!!! I can’t believe how self- centered or self serving all of these comments are. Utterly myopic. I’m out – I have research to do. I have to admit to initially having mixed feelings about this partnership, but decided to wait and see what it entailed. I fully agree that many, perhaps the largest portion, of FamilySearch “trees” are products of poor and often sloppy research, missing, inaccurate, or insufficient documentation, and a substantial amount of wishful thinking. Many stories are built around unverifiable historical constructions. I come from a family of long-time Mormons; some are active; some decidedly inactive, and some have removed themselves from the church altogether (a more challenging task than might be imagined). Researching my ancestry through Mormon sources is a hair-pulling activity. Not least because I am in that latter category, known in the Mormon culture as “apostate”. When I started doing genealogy, it was to create a credible family tree to pass onto my children. I used family records at first, along with some collected materials, and knew many of them were inaccurate. A few decades later, the LDS opened their then new gen website. I often found several conflicting trees for a given person. This was not necessarily bad: since the trees were presented separately, it could be fairly easy to sort out where the error was, and look for more likely possibilities. Later, when the LDS instituted “person identifiers”, in my opinion the situation got worse, as trees were linked by “combining” individuals under one number because their person data matched– but their trees often did not, or were linked anyway, without checking out the data. Sometimes individuals were linked who should not have been. Recently, I looked up the latest configuration of my name line, and found the experience so frustrating I could have cried. (Well, I did, actually.) The name “William” runs through my family like a thread, jumping generations and appearing simultaneously in different but related lines — nephews, cousins, grandchildren, etc. Many times, these various Williams are not carefully examined before assigning them to an identifier, so that generations are linked awonky, or uncles are linked to nephews. In addition, there are other Stratton lines who also have Williams. No relationship has been demonstrated between these lines; as far as can be determined, they originate from different migrants coming into the New World. The fact that these migrants settled separately, in different geographical areas, passed along different sets of family names (other than William, which almost every New England migrant line seemed to have), and did not appear to communicate supports the idea that they were not related. Yet they are routinely confounded, when even a cursory investigation could differentiate them. There was almost no documentation, and most of that was either secondary or hearsay. The tree was full of fanciful assumptions and out and out errors. The idea at FamilySearch was that over time, family researchers would incorporate accurate data, remove inaccurate, and provide appropriate documentation, making the trees useful for research purposes. I think exactly the opposite has happened. And it is obvious that FamilySearch has recognized that as well. There is an increasing emphasis on good research, solid documentation, and fleshing out with the identifying details that make a tree into a story about people who can be clearly identified in a time and place. And there are all those records at FS. And all those resources. Take the 1940 US Census. FamilySearch, using volunteers, managed to index the 1940 census in record time, and that index is available for free to anyone. True, Ancestry.com (a different entity, which FS seems to be making efforts to distance itself from) holds the linked images, and you do have to be a subscriber to access them. But gee, I can just use the free index, which includes the data, and then verify it by accessing the image at NARA or a number of other repositories (I learned that states often keep copies of the images in their own archives). Then there are all the other data FS has access to, and has digitized, especially for the west. That’s six or seven generatons of some of my lines until I get to the migration west from New England and larger Virginia.. Anyone with substantial western research to do will benefit. So, if what I understand so far is accurate, the partnership between FS and NEGHS will enable FS folks (mostly but not exclusively Mormon by any means) to access research data through FS portals that NEGHS already makes available to non-members. In return, NEHGS members get to do the same in reverse. FamilySearch hopes to improve the quality of the research by the folks who use their portal, something that would benefit genealogy in general and in time make available family trees that can truly serve as research aids. NEGHS hopes to expand the scope of research materials available to its members as it positions itself as a genealogial repository and research center of national scope. I think this partnership will open up both groups to a greater awareness of the outside, and make for genealogy of better quality for the one, and greater scope for the other. BTW, as far as I can tell, the only materials on FS that are available only to LDS members are the LDS-specific assigns. And if you are not in LDS, they are of no value to you. 1. AmericanAncestors.org is gaining 1 billion searchable database records from FamilySearch.org. 2. LDS church members will have access to a portion of NEHGS databases on AmericanAncestors.org. 3. Over time, NEHGS and FamilySearch will digitize some collections in the NEHGS holdings (some local newspapers for example) and those records will be available on both websites. 4. In the future, NEHGS will build a family tree application for NEHGS members and AmericanAncestors.org users. That tree application will allow NEHGS tree users to collaborate with FamilySearch tree users, if NEHGS users so wish. Thanks for the clarifications, Ryan. I am especially glad to hear that NEHGS will have its own family tree application. One concern that some people seem to be expressing is that there might be a dilution of scholarship as a result of this partnership. (You may have heard my own sobs of frustration above). With NEHGS developing its own application, I think there is a good opportunity to assure standards from which FS could also benefit. The people in LDS with whom I come into contact are eager to learn and implement good genealogical practices. I am taking webinars given by a Mormon software company that are extremely well-done (and very well attended). As I mention above, this will strengthen genealogy for all of us. They also have some definite strengths that NEGHS clearly will benefit from, and your note confirmed that– Mormons are very good at organizing and getting things done. NEHGS has always had an emphasis on scholarship and on the larger historical context within which family history is contained. Each party has a strength to share, without compromising who they are individually. I should have said “software company owned by LDS members” so as not to imply that the church itself is involved. Just people. Side note regarding accessing US Federal Census images at Ancestry.com: the images for the 1880 and 1940 US Censuses are available to “registered guests” — i.e., non-paying members. Where do I sign up to be a beta user of the new NEHGS-Family Search tree? Would love to give it a whirl! With any new venture–new partnership, new strategic development, new marriage, new career–there are many gains and, inevitably, some losses. Let’s be honest. I’m all for embracing what a partnership with FamilySearch can offer NEHGS, but let’s also be willing to hear and honor the voices that point out the losses. It’s essential that NEHGS really hear the losses as it moves forward. Progress is good, it’s inevitable, let’s take advantage of it, but let’s not forget to honor what NEHGS was in the past. My concern is with the number of additional databases you plan on adding. There is a point where the sheer number of records returned in a search render the entire search useless. That’s why I very seldom use ancestry.com anymore unless I can conduct a very narrow search. The limited focus of NEHGS records has been an advantage in my research, as all my ancestors were in New England until the 1970’s, when we then started to spread out. That said, FamilySearch does have many records that NEHGS should make available. FS recently put Massachusetts deeds online; although not indexed, images of the original paper indexes are there, and so you can find the relevant deeds. Plymouth County Wills are there, also. I am waiting, none-too-patiently, for Bristol County wills to show up. I could order the microfilm from FS, but using film readers makes me nauseous. I find NEHGS to be invaluable in my research and well worth the membership fee. I am finally getting used to the new site, in that I have stopped cursing it under my breath. I would appreciate it if you would remove the SSDI from the general search parameters. While choosing ‘databases with images only’ does rid me of the SSDI results, it also eliminates Torrey’s. Not ideal, but workable. Keep up the good job, Ryan! Ah, the New Site Redesign! Glad you brought it up and not me this time. I’ve refrained from bringing up my disdain for this yet-another-example of dumbing down formats for the only occasional user. I would rather build empires than tear ’em down. But there’s this TREND which has now overtaken my credit union’s 2nd design in 3 years: Bigger lettering, more white space, all of which makes the output to screen run “off” the page, meaning I have to spend more time as a USER scrolling down to see what hits have been returned. Especially with account numbers, the presentation of information seems to be downgraded to presentation of whiteness and in-your-face fonts. Its as if I have to fight through Happy-Smiley-Overinflated Emoticons to get to the information. Also, to get to Advanced Search, I now have to make an extra mouse click. That’s Progress? Your users read the Register, for Henry & Helen’s sake. If they can handle those footnotes, which are often and necessarily articles in themselves, they can handle such a text presentation on the screens in front of them. Users grow as researchers through handling more textually complex material. The Home Page was just fine 2 designs ago. Stop fixing what ain’t broke. Get more databases up. Improve the search return algorithms. Build the empire.